Adrian Brown captured this image of M51 over multiple nights during April and May 2014. He used a Celestron 5-inch SCT at F10, an ATIK ATK16HR camera and a Starlight Xpress AOLF active optics guider. 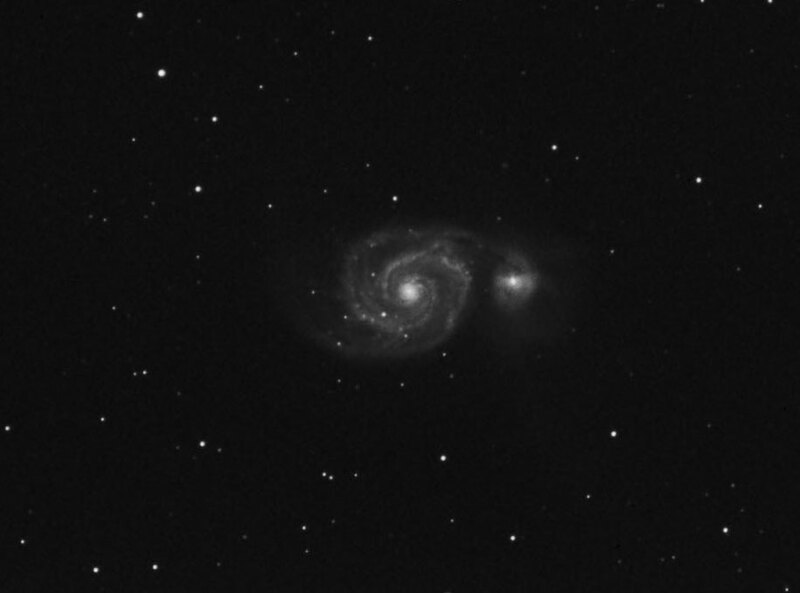 The image data is 40 x 10 minute exposures, processed in Maxim DL 5 and Photoshop CS5. 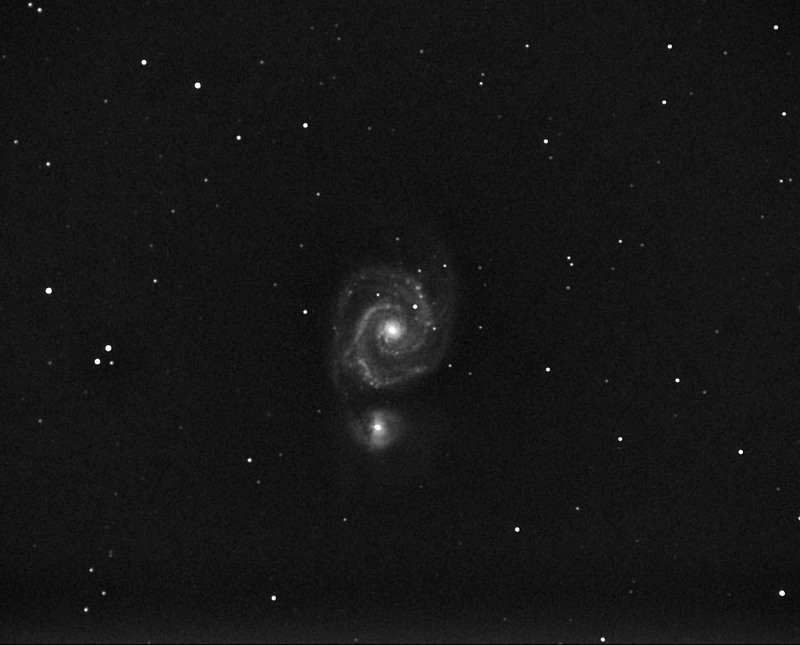 Back in May 2006 Adrian Brown produced a black and white image of M51, using an 80mm refractor. At the time he really wanted to do a colour image but, as usual, the weather didn't cooperate and he wasn't able to achieve it. 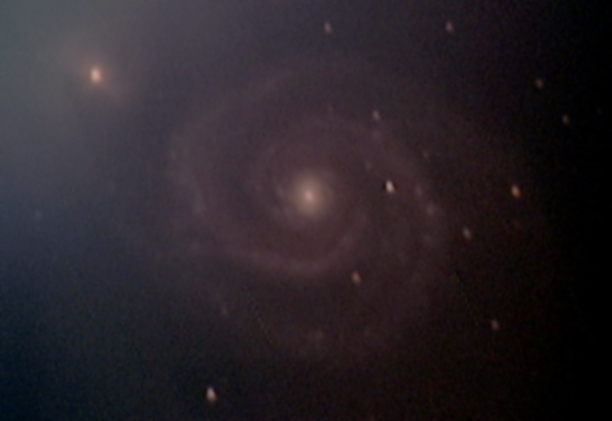 He kept the raw camera exposures from 2006 and he was able to combine them with some new data collected during March 2007 to produce the following deeper image of M51, in colour. The exposure details are: Luminance (Clear) filter = 53 x 5 minutes, Red filter = 21 x 5 minutes, Green filter = 29 x 5 minutes, Blue filter = 31 x 5 minutes (RGB exposures binned 2x2). Image processing consisted of calibrating and stacking the raw exposures in Maxim DL. Adobe Photoshop was used to combine the high-resolution luminance image with the low-resolution colour data. The galaxy was sharpened via an Unsharp-Mask filter and noise in the image background was smoothed with a Gaussian Blur filter. Adrian used the same equipment this time round as was used for the May 2006 image - a Skywatcher 80ED refractor, ATK16HR CCD camera and Astronomik CLS and LRGB filters. For the May 2006 image click here. The following image of M51 was taken by Chris Newsome on the 4th June 2006. He used a Canon EOS 300D camera with a Celestron C8-NGT telescope. The image is comprised of twenty-three 120 second exposures at 400 ASA which were dark calibrated in MaximDL and then processed in CS2 using GradientXTerminator, curves, levels and a high pass filter. A Skywatcher 80T refractor was used as a guide scope with a Meade DSI camera and Maxim DL software. The mount was a CG5/ASGT with a Shoestring GPUSB guide interface. 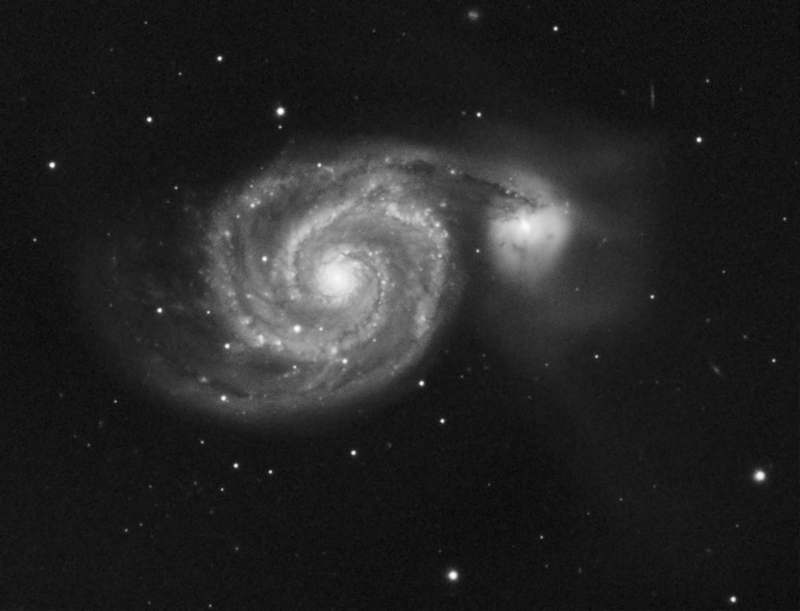 Chris comments: "This is my first real attempt at M51 in Ursa Major. It is a bit 'grainy' due to a heavy bit of processing I had to do on it". 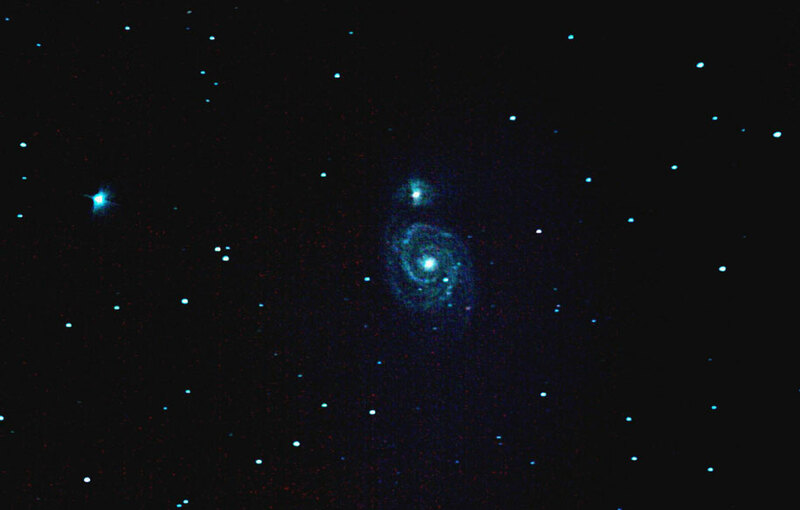 Adrian Brown took the following image of The Whirlpool Galaxy on the 1st May 2006. The grey scale image is comprised of fourteen 5 minute exposures via a Skywatcher 80ED refractor at f7.5 and an ATK16HR CCD camera. Autoguiding was done with a Skywatcher 80T refractor and an ATK2HS CCD camera. For a more recent colour image by Adrian click here. Adrian Brown took the following image of M51 on the 4th November 2005. He used a Skywatcher 80ED refractor as the imaging scope at f/7.5 on a CGE equatorial mount and using a C11 SCT at f/10 as the guidescope. An ATIK ATK-16HR was used as the imaging camera and an ATIK ATK-2HS as the guidescope camera. Adrian also used an Astronomik Luminance filter and an Orion Skyglow Broadband filter. Image aquisition was performed with Artemis Capture and Autoguiding with GuideDog. The exposure was luminance: 8 x 4 minutes. Image calibration and stacking were done in Maxim DL 4.11. Levels, curves and unsharp mask filtering were then performed in Adobe Photoshop. 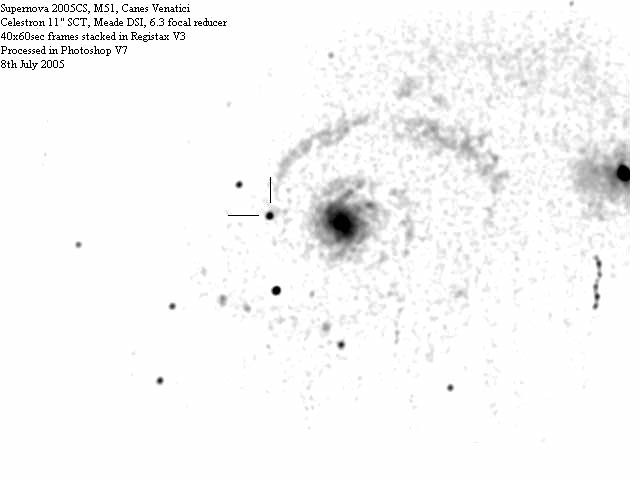 On the 8th July 2005 Adrian Brown and Chris Newsome had a go at imaging a supernova 2005CS in M51. The galaxy itself was immersed in a bright Derby sky and Chris notes that even with forty 60 second frames, it didn't come through as clearly as they would have hoped. 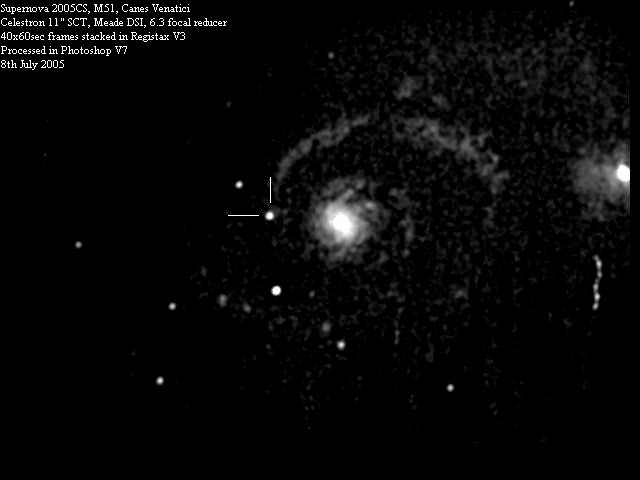 The raw images were stacked and this has brought out the supernova (which was clearly visible to the eye at the telescope). Chris converted the stacked image to greyscale before processing it and both normal and negative versions are shown below. The images were taken through Adrian's 11" Celestron SCT and recorded with Chris' Meade DSI, stacked in Registax v3 and processed in Photoshop v7.